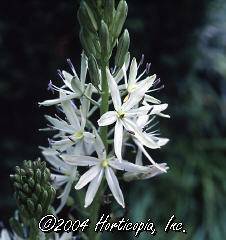 Camassia leichtlinii (Bak.) S. Wats. Habitat preferences: Meadows, prairies and hillsides that are moist in early spring. Likes sun but tolerates light shade. Plant strategy type/successional stage: This plant is a grassland forb. There is some evidence to suggest that it may expand its range after fire and enjoy sites opened by disturbance. Seed germination: Best sown as soon as it is ripe in a cold frame or can also be sown in a cold frame in spring. Germination takes 1 - 6 months at 15°c, but it can be erratic. Propagation recommendations: Sow the seed thinly so that it does not need to be thinned and allow the seedlings to grow on undisturbed for their first year. Give an occasional liquid feed to ensure that the plants do not become nutrient deficient. When the plants are dormant in late summer, pot up the small bulbs putting 2 - 3 bulbs in each pot. Grow them on for another one or two years in a cold frame before planting them out when dormant in late summer. Can also be propagated from offsets in late summer. The bulb has to be scored in order to produce offsets. Soil or medium requirements: Enjoys heavy loam mixes, but tolerant of other soil types. Needs moisture during growing season.